I can’t think of anything more Swedish than a Swedish Semla. Or correction, Scandinavian, since they are available throughout Scandinavia. However, they go by a different name. This cream puff is an acquired taste. I don’t know anyone who kind of likes a Swedish semla. Either you like or you don’t. I love it. What’s not to like? It’s a wheat bun with cardamom filled with almond paste and whipped cream. 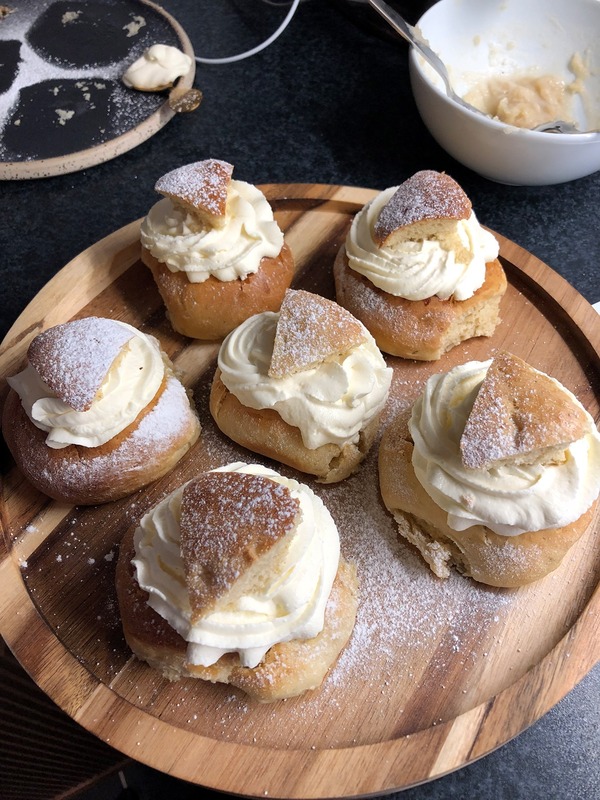 Usually, you eat the Swedish Semla on Shrove Tuesday, and a few decades back bakeries were only allowed to sell them on Tuesdays until Easter. However, now you can pretty much get them just after Christmas and until Easter. 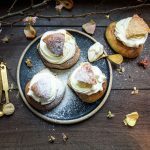 There’s an abundance of recipes on how to make the perfect semla. There are a few requirements on how they should be. The bun needs to moist and fluffy. The almond paste needs to taste like almond and be creamy. The whipped cream should be lightly whipped, but not runny. Easy huh? Don’t worry it will be like a walk in the park. Make sure that the almond milk or regular milk is no more than 37 degrees C. Fresh yeast can die if it’s too warm. If it’s too cold it only takes longer for the buns to rise. Make sure your dough gets to rise in a warm draft-free place. Dough likes it when it’s humid and warm. Let the buns cool on an oven rack. Whipp the whipping cream slowly until it’s firm but not too hard. Make sure all your ingredients are the same temperature. Especially eggs and butter. A fluffy cardamom bun filled with sweet and smooth almond paste. Topped with airy and creamy whipped cream. A Swedish classic. Heat the almond milk to 37C add cardamom and dissolve with the yeast. Add sugar, salt, butter and egg and mix it. Mix bicarbonate with the flour and add it to the butter and egg mixture. Knead for about 5-6 minutes. Let the dough rise under a clean tea towel for about 45 minutes. Split the dough into 12 pieces and roll them into round balls. Place them on a baking sheet. Let the dough balls rise for another 45 minutes under a tea towel. Set the oven to 200C/fan and bake in the middle of the oven for about 6-7 minutes. Let the buns cool completely and make the filling in the meantime. Grate the almond paste and mix it with almond milk until smooth. And whip the cream until firm. Make the lids by cutting small triangles on the top and make little holes in the bottom bun. 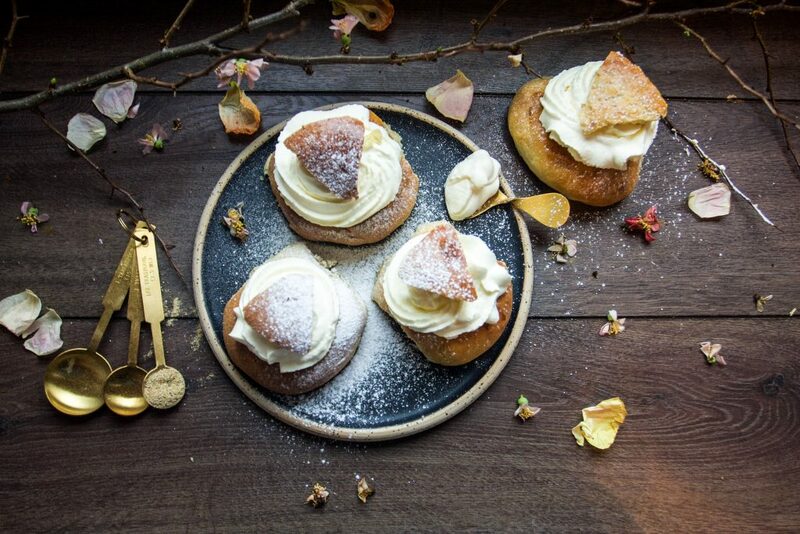 Fill the Swedish semla with almond paste and whipped cream. Sift icing sugar on top.